Picture this: a giant solar power plant floating in space, gathering the sun’s energy with virtually no constraints from the weather, seasons or time of day, delivering a constant supply of green energy to Earth. Sound a little too Sci-Fi? Well, thanks to JAXA, the Japan Aerospace Exploration Agency, we could actually witness this incredible technology in just over a decade. The idea of a space power plant has actually been around for a while. Back in 1968, American aerospace engineer Dr. Peter Glaser pioneered the space solar power concept and proposed the deployment of giant solar panels in space in order to generate microwaves that could be transmitted back to Earth to produce electricity. The concept sparked a lot of interest, even from NASA, but it came to a halt in the ‘80s because of the high costs involved. Japan, however, pursued the idea and is currently the world leader of the Space Solar Power Systems (SSPS) project. This colossal satellite, hovering around 22,000 miles (36,000 kilometers) above Earth, would be several miles long and weigh a whopping 10,000 metric tons. These floating solar panels would actually be tethered to a station on the ground in order to keep the satellite at a fixed point in geostationary orbit. The proposed model also includes a set of mirrors that reflect the sun’s light onto the panels so that when the satellite is not facing the sun it can still receive sunlight. And now for the really tricky part: getting all of that solar energy back to Earth so that we can use it. There are two possible ways that this could be achieved which involve converting the solar energy into either laser beams or microwaves, or perhaps even a combination of both, which would then be transmitted to a receiving facility (called a “rectenna” [rectifying antenna]) situated on Earth. Ground-based experiments are currently underway to discern which option would be most efficient. These space based solar panels would be around 5-10 times more efficient than ground-based solar conversion systems. Furthermore, CO2 emissions will be low and will only come from the receiving facility. It’s predicted that SSPS will be able to process around 1 gigawatt of power, which is a similar amount to nuclear power stations. Although Japan are the leading country with regards to making SSPS happen, in reality the costs will be so astronomical that it is likely contributions from other countries will be required before we see this behemoth space power station start to take shape. This concept may seem a little far-fetched, but JAXA believe they are getting tantalizingly close to turning this vision into a reality. In an attempt to further drop the cost of solar power, Bandgap Engineering, a startup in Woburn, Mass., is developing a nanowire-based solar cell that could eventually generate twice as much power as conventional solar cells. That’s a long-term project, but meanwhile the company is about to start selling a simpler version of the technology, using silicon nanowires that can improve the performance and lower the cost of conventional silicon solar cells. Bandgap says its nanowires, which can be built using existing manufacturing tools, boost the power output of solar cells by increasing the amount of light the cells can absorb. Right now most solar-panel manufacturers aren’t building new factories because the market for their product is glutted. But if market conditions improve and manufacturers do start building, they’ll be able to introduce larger changes to production lines. In that case the Bandgap technology could make it possible to change solar cells more significantly. For example, by increasing light absorption, it could allow manufacturers to use far thinner wafers of silicon, reducing the largest part of a solar cell’s cost. It could also enable manufacturers to use copper wires instead of more expensive silver wires to collect charge from the solar panels. These changes could lead to solar panels that convert more than 20% of the energy in sunlight into electricity (compared with about 15% for most solar cells now) yet cost only $1 per watt to produce and install, says Richard Chleboski, Bandgap’s CEO. (Solar installations cost a few dollars per watt now, depending on their size and type.) Over the operating lifetime of the system, costs would come to $0.06-0.10 per kilowatt-hour. That’s still higher than the current cost of natural-gas power in the United States, which is about $0.04 per kilowatt-hour. But it’s low enough to secure solar power a substantial market in many parts of the world where energy costs can be higher, or in certain niche markets in the United States. Meanwhile, Bandgap is pursuing technology that could someday improve efficiency enough to allow solar power to compete widely with fossil fuels. Double the efficiency of solar cells without greatly increasing manufacturing costs, and you substantially lower the cost per watt of solar panels and halve the cost of installation — currently the biggest expense in solar power — by making it possible to get the same amount of power out of half as many cells. Both the cells Bandgap is about to introduce and the cells it hopes to produce in the long term are based on the idea of minimizing the energy loss that typically occurs when light passes through a solar cell unabsorbed or when certain wavelengths of light are absorbed but don’t have enough energy to dislodge electrons to create electricity. (That energy is wasted as heat.) In a conventional solar cell, at least two-thirds of the energy in sunlight is wasted — usually much more. The company’s existing technology makes use of the fact that when light encounters the nanowires, it’s refracted in a way that causes it to bounce around in the solar cell rather than simply moving through it or bouncing off it. That increases its chances of being absorbed. But what Bandgap ultimately wants to do is to change the way light is converted to electricity inside the cell. If the nanowires can be made uniformly enough, and if they can be formed in such a way that their atoms line up along certain planes, the tiny structures could change the electronic properties of silicon. These changes could allow solar cells to generate electricity from low-energy light that normally produces only heat, says Marcie Black, the company’s founder and chief technology officer. It does this in part by providing a way to combine energy from more than one photon of low-energy light. The technology could take many years to develop. For one thing, it requires very precise control over the properties of each of millions of nanowires. Also, the techniques needed to make the solar cells might not be cheap or reliable enough to produce them on a large scale. But such solar cells could theoretically convert 60% of the energy in sunlight into electricity. 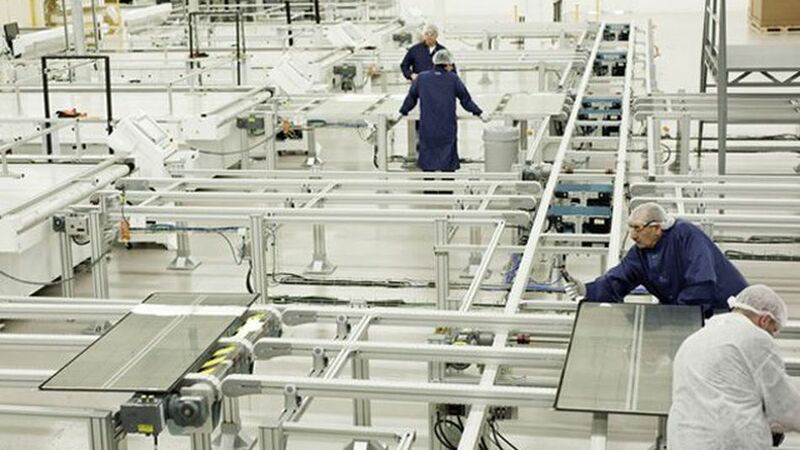 That will be hard to achieve in practice, so the company is aiming at a more modest 38% efficiency, which is still more than twice that of typical silicon solar cells made now. Researchers are taking several other approaches to producing very high-efficiency solar cells, such as using quantum dots or combining several kinds of materials. 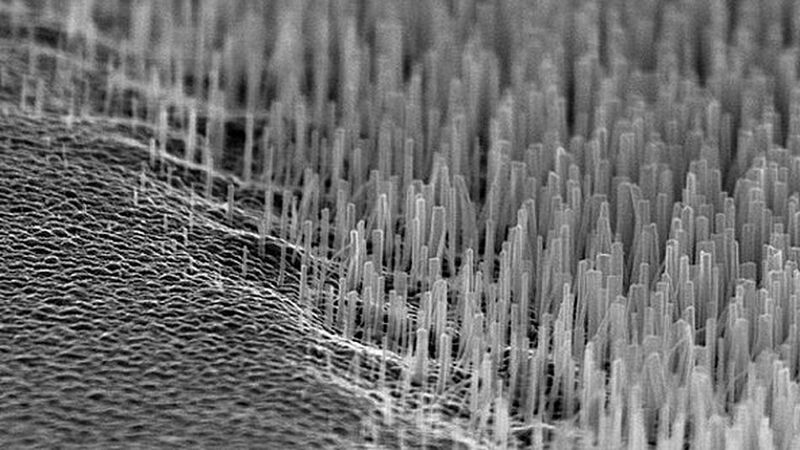 The nanowire technology could be simpler, however. “In theory, the approach has many potential advantages, but you’ve got to get it to work,” says Andrew Norman, a senior researcher at the National Renewable Energy Laboratory in Golden, Colo.
Building solar and wind projects in the wrong place is wasting billions of dollars in Europe. Siemens says it would make sense to build solar power plants in sunny countries in Europe rather than in cloudy ones. And wind turbines should be built in windy places. These blindingly obvious suggestions run contrary to what’s actually happening. For example, a solar panel in Spain generates about twice as much electricity as the same-size solar panel in Germany because the sun shines on it more. But last year nearly half of all solar panels installed in Europe were installed in Germany, and only a small fraction were installed in Spain (see “The Great German Energy Experiment“). Siemens calculates that if you were to install solar panels and wind turbines where the natural resources are best, and then string power lines to convey the power to where it’s needed, you could save about $60 billion dollars by 2030 because you could install fewer of them. That savings figure accounts for the cost of the power lines (see “Supergrids“). Europe isn’t the only place where solar is taking off in strange places. One of the major markets for solar power in the U.S. is New Jersey, which gets far less sun than the southwest U.S., but has policies that favor solar power. When the Chinese energy giant Hanergy decided last week to buy Miasole, a Silicon Valley-based thin-film solar company, at less than a tenth the amount venture capitalists had invested in the firm, it could have been making a savvy move. Though it seems as if thin-film solar panels have no hope of competing with conventional silicon ones under today’s market conditions, the technology might still have a strong future. Some analysts think the companies that have been snatching up these bargains know what they’re doing. The poor market conditions that have kept thin-film companies from competing may not last: When demand increases and it comes time to start building solar-panel factories again, the argument goes, the technology might have a significant advantage, because for comparably sized plants, it could cost far less to build a new thin-film factory than a conventional one. Waiting for market conditions to turn, however, is a risky strategy. The market is currently flooded with solar panels — current manufacturing capacity is more than enough to satisfy demand, and that’s driven down prices to the point that many manufacturers are selling at a loss. It’s not clear how long it will take for this situation to change. Timing the construction of new thin-film factories will be difficult. In the meantime, manufacturers of conventional silicon technology continue to lower the cost of their solar panels and improve their efficiency. And there’s no guarantee that new thin-film panels will perform as expected when produced at a large scale — or that cost targets will be met. One option could be for large companies to develop and build their own solar power plants. That’s the model used by First Solar, and it seems to be the model Hanergy is adopting. But many analysts remain skeptical that thin film can compete with silicon, given silicon’s overwhelmingly larger scale of production. Thin film may have had a chance once, but it’s taken it too long to reach large-scale production and lower costs, according to Jenny Chase, manager of the Solar Insight Team at Bloomberg New Energy Finance. “That ship has sailed,” she says. She expects that thin-film companies might succeed only in niche markets, such as applications where very lightweight or flexible solar panels are needed. Google has reportedly been testing flying drones that could be capable of delivering high-speed Internet to the ground. The secretive Project SkyBender would see the solar-powered vehicles supply a 5G-equivalent connection for consumers. The claims all stem from a report by The Guardian, which found that Google was testing solar-powered drones at Spaceport America in New Mexico. This spaceport is the one being used by Virgin Galactic for its tourism business. Google has taken up residence at the spaceport, where it has been using its own control center to monitor an optionally piloted aircraft, a Centaur, which is a vehicle that can operate both with and without a human on board. The aircraft is using millimeter-wave technology to communicate, which has been touted as a way to deliver high-speed Internet, with speeds of several gigabits a second possible. This is 40 times faster than the technology used in 4G today. The only issue with millimeter-wave is that is fades quickly, something Google has been aiming to solve with these tests. Google has its sights set on thousands of high-altitude autonomous drones being used to beam Internet to the ground. Indeed, alongside the Centaur aircraft the tech company has been flying a solar-powered drone called Solara 50, which could one day form the cornerstone of this service. Google has permission to continue tests until July, and this isnt the only ambitious Internet-delivery project it has on the go. It is also working on Project Loon, a series of high-altitude balloons that can beam a connection to the ground. Both are in their very early stages at the moment, though, soof coursethere are no details on when, or if, either will become commercially available. But the developments will be interesting to keep an eye on, at any rate. And this isnt the only news coming out of Spaceport America. On February 19, Virgin Galactic are planning to unveil their new SpaceShipTwo vehicle that will take paying customers into space in the next few years, following the tragic disaster back in November 2014that saw co-pilot Michael Alsburylose his life. As the price of solar panels has plummeted, the amount of solar power being generated worldwide is soaring. Yet solar still accounts for less than 2% of the world’s total electricity capacity. Each square meter of solar panel generates around 145 watts of electrical power, enough to turn on just two or three light bulbs. That means you’d have to cover the National Mall in Washington, D.C. five or six times over to match the peak capacity of a large fossil-fuel power plant. What’s more, every one of those panels needs to be installed by hand. 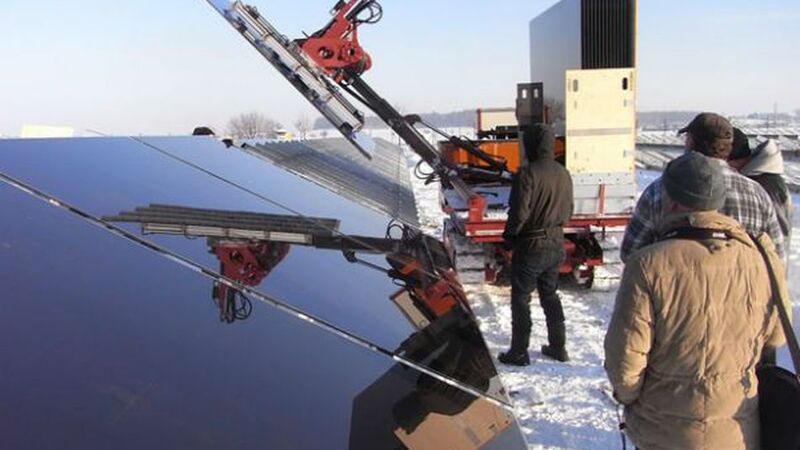 Now companies such as PV Kraftwerker and Gehrlicher in Germany are developing mobile robots that can automatically install ground-mounted solar panels day and night, in all sorts of weather. PV Kraftwerker’s robot is designed to assemble power-plant-grade solar panels, which are four times the size of the ones you’d see on a home. 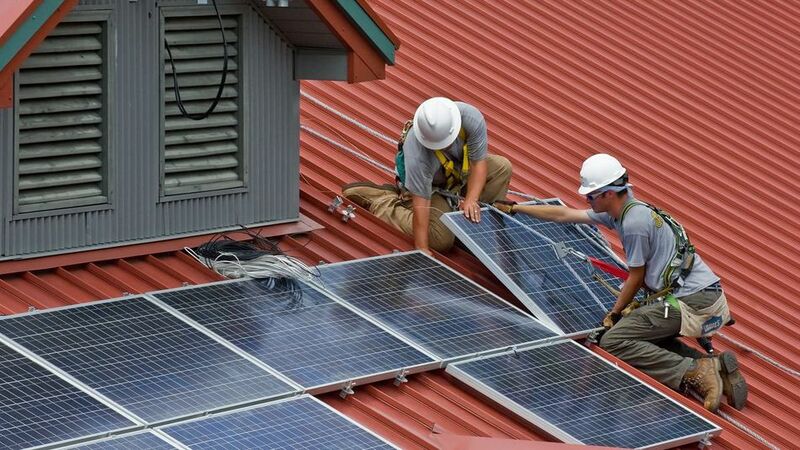 The main idea is to save money on labor, which accounts for a growing fraction of the cost of solar power as panels get cheaper. According to PV Kraftwerker, a construction firm specializing in solar parks, installations that used to require 35 workers can now be done with just three workers in an eighth the time. For a 14-megawatt solar plant, the company estimates, it might cost about $2 million to install the panels manually. Using the robot could cut that cost by nearly half. The company says that the robot, which lists for $900,000, could pay for itself in less than a year of steady use. Robotic help could be a plus given Germany’s ambitious plans to get a third of its electricity from renewable sources within eight years and 80% by 2050 (see: The Great German Energy Experiment). Germany led the world in solar installations in 2011, putting up panels capable of generating around 7.5 gigawatts and covering an estimated 50 square kilometers of ground and rooftops. PV Kraftwerker built its robot from off-the-shelf Japanese components. The machinery consists of a robotic arm mounted on an all-terrain vehicle with tanklike tracks. Suction cups grip the glass face of the solar panels and the arm swings them into place, guided by cameras that give the robot a three-dimensional view of the scene. The robot’s limitations give a glimpse of how hard it’s going to be to completely automate the installation process. Much solar power in Germany is generated by rooftop arrays, but the shape and orientation of roofs is too varied for robots to handle. Even for small solar farms and those using ordinary-size panels, human workers are both faster and cheaper than the robot, says Markus Gattenlöhner, head of marketing at PV Kraftwerker. Christian Hoepfner, a scientific director at the Fraunhofer Center for Sustainable Energy Systems (see: Redesigning Solar Power), agrees that the role of robots will be limited. So far, the PV Kraftwerker robot can only do one thing: lay panels on a metal frame that humans have already installed. Two people walking along beside the robot screw the panels to the frame and make electrical connections. Yet robotic installation may become more common as other components get adapted to automation. PV Kraftwerker and other companies are also developing robots that, guided by GPS, can pound poles into the ground and then mount panels on them, eliminating the need for workers to install frames. Newer solar modules can be snapped or glued into position instead of being screwed in. Special plugs could even allow robots to make the electrical connections (see: New Solar Panel Designs Make Installation Cheaper). Robots like these could be useful in bringing electricity to inhospitable environments. The Japanese government commissioned PV Kraftwerker to develop a version of its robot that could install a solar power plant largely on its own in radioactive areas near the site of the Fukushima nuclear-plant disaster. Gattenlöhner says Japan wants the robot within six months.